The video would have been more effective if shown with slides, but Taylor has plenty of these on his own site, particularly “Expeditions” (My own short story in DADT-III is called “Expedition” – coincidence). You have to click through to see the various galleries. Taylor grew up near Texarkana, AR but moved to Reno to go to the Davidson Academy. He has gotten support from Peter Thiel. I believe his labs are at the University of Nevada in Reno. The dress is informal, and his facial features bear a striking resemblance to those of his mother. Brian Williams had done an outdoor hike interview of him (Major Issues, Nov. 7, 2015), exploring desert and caves for radioactive elements in western Nevada. .
Taylor is most famous for building a small fusion reactor at home at age 14, as explained the book about him by Tom Clynes (book reviews Dec. 14, 2015). Taylor talked about his idea that the power grids could become more secure if decentralized by having a lot more small underground local reactors. Many of these could be fission reactors, with new designs. He also talked about futurism and space travel. He did mention the medical issues associated with prolonged weightlessness of low gravity, which can include eyesight loss. He thinks Mars should be settled before the Moon. Is it OK to live at 40% gravity but not 18%? One question not mentioned is artificial gravity, which can be generated with centrifugal devices, but applies only to objects in contact with the surface. I have to deal with this idea in my screenplay “Do Ask, Do Tell: Epiphany”. 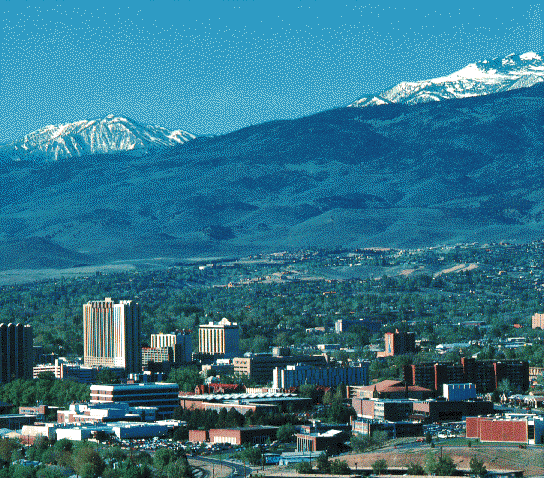 Wikipedia attribution link for picture (pd) of Reno with University. Also, the Oscar nominations for 2017 have been announced this morning, here.